Northwestern University Center for Public Safety founder Franklin Kremmel (1907 - 1998) was a nationally recognized transportation and traffic safety authority. Kremmel, though, is not the only Northwestern figure to make an indelible impression on modern law enforcement. 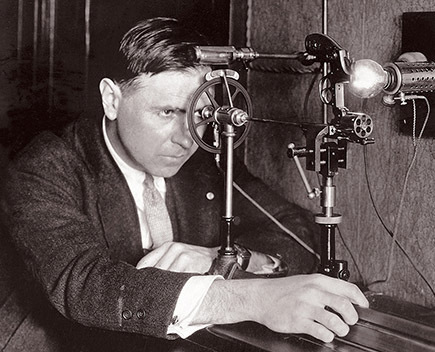 In 1929, Calvin H. Goddard (1891 - 1955), the "father of forensic ballistics," developed the nation's first "Scientific Crime Detection Laboratory" at Northwestern's School of Law. He is credited with perfecting the comparison microscope for bullet and cartridge case examinations. Following Chicago’s infamous 1929 St. Valentine’s Day Massacre, Bundesen was determined to bring Goddard to Chicago to “revamp the city’s image” through lab work independent of the police. 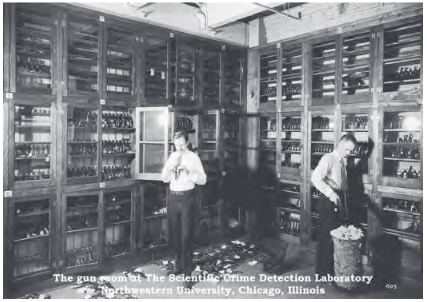 (Northwestern) “With support from the law school dean, John Henry Wigmore, the Scientific Crime Detection Laboratory, the country’s first independent criminological lab, was born.” (Northwestern) Goddard’s research at this lab confirmed that Al Capone’s gang was involved in the slaughter. Ball & Gillespie Polygraph. (n.d.). The Polygraph Museum: Leonarde Keeler and His Instruments. http://www.lie2me.net/thepolygraphmuseum/id12.html. Grant, Robert and Jospeh Katz. (1998). The Great Trials of the Twenties: The Watershed Decade in America’s Courtrooms. New York: Da Capo Press. Yount, Lisa. (2007). Forensic Science: From Fibers to Fingerprints. New York: Infobase Publishing. Photo Credit of Calvin Goddard: Northwestern magazine.